We have the pleasure of profiling another rising star in the Fine Arts community. for her self in the Christchurch art scene. at balancing her studies and professional development at as an artist. yet she finds it quite realistic as it involves movement, colour and texture. just like I fix paints onto the surface of canvas. The surface is highly influenced by light. The surface changes along with the light just like the world. or a ray of the sun comes filtering through the clouds. I capture the still of the movement, the force in the fragile/vain." It is new but again nostalgic as the works have both greenness (freshness) and nostalgia. and reflecting on them in plastic form. I use colour, texture, free movement, as means to express an inner state. Poetry is important to me - it often feeds me process. dreams - possibilities - remembered sights, sounds, fragrances. I think that memory plays an important role when it comes to imagination. My paintings started from a meditation on life and death, light and darkness. but I can feel them and what I am feeling is "a vague life", "a vague death". There are no words left. But there is something that you could "see". My work consists primarily in painting, but I mostly exhibit my work as an installation. The expression of my thoughts becomes material through my painting. Because when I work my feelings and senses are connected, similar to meditation. Thin coats of colour are layered over and over again on the surface by using oil, acrylic, medium, ink, paint, paper, fiber, corn silk and rice. When the paintings are completed, their surface is highly influenced by light; they slow changes in colour depending upon the angle of viewing. Layering alludes to information collected through the senses; it reflects my ideas about memory and its emotional expression, about the spirituality, which infuses my environment, and also about the ambiguity of process. Pausing by Kaori Mori's works engenders sleep-strange feelings. The paintings have a quiet way of taking you in. Moving forward needs to be slow and careful, to account for the subtle changes in an atmosphere which invites beholding, yet retains its mystery. The paintings are made with a printmaker's dedication: on the strata of gesso and modelling compound, thin coats of colour are layered time and time again. Nevertheless, gestural repetition finds its own way of eluding the identical, while hue melts into tone or dissolves into veil. Kaori Mori's approach is direct and persistent: the materials she uses are mixed on the support to create the picture plane. And still, this simple procedure allows a rich archeology of the indefinable to surface into being. Maze... and beyond is built on a series of paradoxes. The tactile, sensuous surface of the paintings guides away from sight into memory. No trace of the painter's presence endures; the only remaining signposts are directions of flow. While formally reminding of the order and complexities of nature, the paintings deny too close a link to the natural through repeated cancellations. The overall build-up of precious and non-precious materials is blank, yet never fails to call for spiritual associations. It is as if Kaori Mori was wondering in what proportion the materiality of media might approximate the immaterial. If these paintings encourage a dialogue, then it would have to be a dialogue with oneself. Fragile yet so present, Maze... and beyond proposes a tracing of the soul's wanderings in and out of the word. It invites all viewing to remember, and open up to, the mystery of things. Kaeru (Kaheru) does not have a precise equivalent in English, but means "to return (home or to where the subject belongs) ". Roy Andrew Miller described Japanese language in his book 'Japan's Modern Myth' in 1982, "...the Japanese language possesses a kind of spirit or soul that sets it apart from all other languages, which do not possess such a spiritual entity; or that the Japanese language is somehow purer, and has been less involved in the course of its history with that normal process of language change and language mixture that has been the common fate of all other known human languages"
In the world today, the arts of the intellect are held in high regards; there is less space for an art of sensitivity. Information can be received consciously, as well as unconsciously, yet there are less and less opportunities for experiencing pure sense impressions, in an environment that has little or nothing to do with conscious control. My paintings are about offering an experience of pure sense impressions. The viewer can relate to the work though accessing individual senses, and maybe focusing calmly on this experience. The work that I make completes itself when completed by the person standing in front of it. Beyond the maze lies and open invitation. Susan Sontag once said "Every detail or subtle nuance revealed by the artists hand was once an observation a memory or a future aspiration, homage to a reality independent of self." 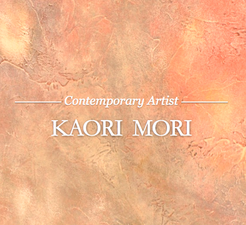 Since arriving from Japan in 1999, Kaori Mori has existed in a world where the social and cultural universes of her own country and her adopted land have often been on a collision course. But in her painting Mori is released from the constraints of either culture and is able to poke, prod and pursue a personal vision drawn from experiences and observations of both lands and both cultures. Her first exhibitin at CoCA (the Centre of Contemporary Art) in 2006, was entitled Maze... and beyond, where the artist explored through paint the cyclic nature of life. In those works, large spheres appeared to float across tactile canvases, the spherical elements swirled and spun from the murky, grey and green depths of the canvas and then seemingly faded from view, provoking a feeling in the viewer of flux and transience. In this latest exhibition the spherical or cosmological elements have almost completely disappeared but the feeling evoked from the canvas of transience and reserve remains. The format is tighter; the colours are no longer dark and somber but light and luminous and the paintings read as a suite of works or more completely as an installation. Still referencing the cycle of life, the artist has placed a greater emphasis in this exhibition, on the idea of regeneration or Ka heru, the Japanese word for return. To this end, layers of both texture and colour and revealed very gradually to the viewer. What appears to the eye on first looking develops even further (depending on the light) as layer upon dappled layer of paint resurfaces, suggesting a shedding of an exterior skin to reveal a smooth and shimmering new stratum beneath. As the viewers are left to grapple with the anxiety of interpretation, an ambiguity and uncertainty is created around these abstract works and of the physical process of painting. The beauty of abstract expressionism is that it frees the gesture from the tyranny of depiction; however, it also carries with it a need for strict self-discipline. In Ka-heru, Mori has exerted the skill and discipline needed to carry off this difficult undertaking, which is lesser hands would reduce the work to mere decoration. It is very difficult to express thoughts or emotions verbally. To translate accurately might be impossible, futile or even meaningless. All I can do is to be conscious of it. The difficulty of being conscious is that I have to be aware/conscious of it to recognize it. The act of ringing my inner subconsciousness to a conscious state is to express my feelings and thoughts through my work, therefor, translation. I still cannot forget the shock when I unveiled Mori's work for the first time. Under the veil of carefully layered colour and light, secretly emerge colours of various expressions. The expression changes constantly depending upon the light and shadow. The delicacy, the beauty, and the atmosphere drew me in immediately. but at the beginning, it should all start with being aware (conscious) of something." Consciousness=existence. Focusing and intensifying that notion, combined with her genuine sensitivity, a world so beautiful opens up. "I don't know why, but the series ended up with 5 pieces, no more and no less. There was something in my sub-conscious that decided it. I still have no idea what it was." she said. Some day, she will tell me with passion, I can hardly wait for the moment to come. "Kaori has held several successful exhibitions displaying work that is not only beautifully executed as is everything she does but complex sophisticated works which engage the viewer in a variety of ways." "Her work is impressive in her capacity to craft resolute and beautiful images that, at their most abstract, are compelling and evocative. I am also impressed by her commitment to her practice. It was unusual for the gallery to place a senior artist alongside a recent graduate but the maturity and quality of her work ensured that it retained a presence and strength in the exhibition space." "Her work is of a consistently high standard and shows evidence of the significant tought process that she puts into her art. Images of her work have been chosen on a number of occasions to represent the D&A." Christchurch's annual collective gallery open-evening. Art Trek will take you into the cultural heart of the city to enjoy a diverse range of artistic activities in public galleries, dealer galleries and not-for-profit art spaces. Moved to Christchurch, New Zealand. Moved to London, Uníted Kíngdom. Enjoy the ocean, river and mountains. Love nature, landscape, drink and cuisines. Please state your name, if you don't mind.